It features a young owl painted by the famous 16th-century artist, Albrecht Durer. What a perfect image to place in your favorite room. Albrecht Durer. "Young Owl". 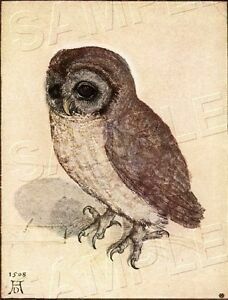 CLASSIC ANTIQUE OWL IMAGE! Professionally Printed on 100% Genuine Artist's Canvas.